I don’t mean to sound so happy about this, but how about this chilling-down-of-the-weather situation? Haaappy dance! It’s time to bust out the Instant Pots, slow cookers, or big ol’ soup pots again because my favorite season is making its annual appearance. SOUP SEASON! And this humble, modern-ish minestrone has everything you could probably ever want: veggies, more veggies, one more pile of veggies, basil pesto, yummy tomato sauce, beans, bulgur (we’ll talk this over shortly), fresh parsley, garlic, smoked paprika, and parmesan on top! And crusty bread on the side! Dang, Gina. 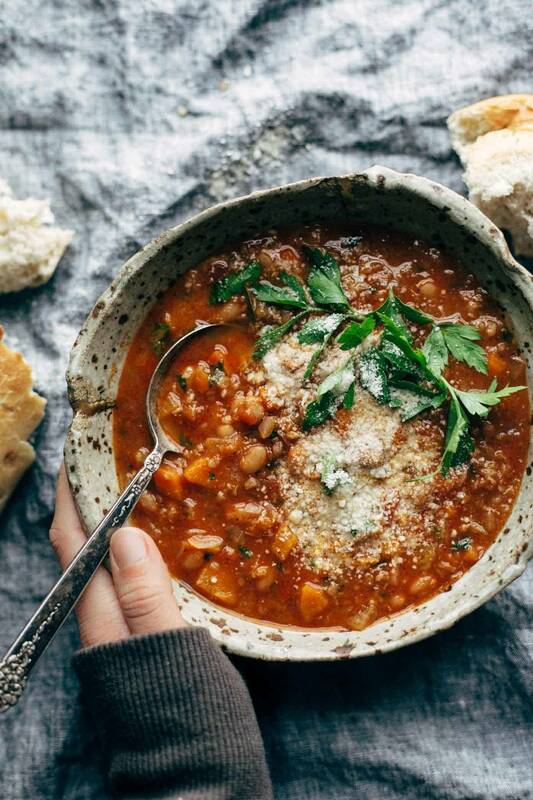 That is one winter-body-lovin soup. Like, the good kind of winter body. Just… nevermind. I have a special love connection with this minestrone because my neighbor Pam (👋🏼 remember Pam? originator of carrot cake cupcakes?) makes a minestrone that is kinda like this, only better. Better because 1) it’s always better when someone else makes it. And 2) because actually it IS better. It has bacon. Mine has smoked paprika instead of bacon. I know. WHY DO YOU EVEN FOLLOW ME. Is it weird that I can still vividly remember the exact first time I ate this minestrone, oh, let’s see, FIFTEEN YEARS AGO? I remember sitting around a superlong table, huddled up with a bunch of neighbors, in a cabin in the Wisconsin woods, and Pam dishing out her Minestrone to the masses after a “long day” where my only job in life was to go snowmobiling and play card games. Honestly, sometimes the food details that live inside my brain are borderline alarming. Is this really why I can’t remember where I put my water bottle this morning? Because this obscure, wonderful memory of Pam’s minestrone and a green can of Parmesan cheese around a cozy cabin the Wisconsin woods is taking up space in the corners of my brain? Okay, so Minestrone. Modern minestrone. Without pasta! Let me try to defend the – pasta + bulgur decision. First of all, have you ever even had bulgur? Guys. It’s Yum City. Chewy, nutty, wheaty (makes sense, since it is, in fact, wheat). Secondly, nutrition. Think complex carbs, fiber, and protein. I dunno, maybe you’ll feel awesome after you casually eat it in your Instant Pot minestrone? Thirdly, just try it already. If you don’t like it you can go back to pasta like a regular person. Or barley like Pam’s original version. I will allow adaptations. Instant Pot. There’s a time and place for the healing powers of sautéing garlic and onion, or the smell of something in your oven, or the sound of a pot of soup simmering on the stove. I fully believe that. There’s also a time and place for putting your feet up and pressing a button on an electric cooker machine thing. Fully believe that, too. DeLallo pesto. We are long-time users and lovers of DeLallo. Evidence: here. DeLallo marinara sauce, or any of their tomato sauces. These are hands-down my favorite jarred sauces – they’re all clean, no added sugar (which is surprisingly hard to find), made with really high quality ingredients. Yes please. Love it. Guys, I can’t stress enough how happy I am to be back in the swing of soup season. It is my zone. Use the code PINCH25 at checkout to receive 25% off your purchase at DeLallo.com through 10/31/17! Excludes sampler kits and gift cards. Instant Pot Minestrone! With tons of veggies, beans, pesto, tomato sauce, parsley, topped with Parmesan, served with bread. Veg-friendly, nutritious, easily made vegan. Part One: Place everything in the first list inside an Instant Pot / pressure cooker. Turn on the soup setting (30 minutes). Go put your feet up! Part Two: Use the quick release to let the steam out (hang on, it takes a few minutes). Pull out the bay leaves. Add the bulgur, replace cover, and let it all sit together to cook the bulgur for a while (about 20 minutes). Add more water as needed. Serve like a boss: Serve with Parmesan and fresh parsley. I’d also like to mention that the leftovers are mighty delicious. In a slow cooker: Place all ingredients except bulgur in a slow cooker and cook for 6-8 hours on low heat. Mix bulgur in at the end and let it rest for 30 minutes or so (doing this near the end helps it stay chewy rather than turning to mush). On the stovetop: Saute the carrots, celery, onions, garlic, and pesto until the vegetables are soft. Add the beans, spices, liquids, and cabbage and simmer for an hour or so. Add bulgur at the end until cooked. Longer simmer = better flavor. Smoked paprika adds a smoky depth to the flavor of this soup that can also be achieved with bacon! If you prefer, just mince a few pieces of bacon and add to the mix instead. It’s YUMMY, but the downside is that it makes the soup a little more greasy, which is why this version is written with the smoked paprika instead. Traditional minestrone would use pasta (and that works fine here if you want to make that sub). I used bulgur here because I liked the nutrition and chewiness of it as compared to the pasta! If you don’t have a jar of pasta sauce or marinara sauce, you CAN use a can of diced tomatoes, but I would recommend adding more seasoning to compensate for what you’re missing with the pasta sauce or marinara. We tried freezing this recipe and would not recommend it as it gets too mushy when reheated. If you need this recipe to be vegan, you’ll need to buy vegan pesto or make it yourself. This one might be nice! Thank you to DeLallo for sponsoring this post! This recipe is part of our collection of best healthy soups. Check it out! I don’t have the instant pot but this looked so warm and filling. I made it with butter nut squash, carrots, celery, yellow summer squash, yellow bell pepper, napa cabbage, green beans, cauliflower, navy beans, and diced tomatoes with sweet onion. The smoked paprika with my roasted balsamic tomato sauce from harvest 2016 made an amazing base. Beef stock to fortify it, some mini sausage meatballs to appease the meat lovers and ring pasta for the kid made this a winning dish for ALL! We all went back for seconds and wanted to lick the bowls. Thanks for the inspiration! YUM! Glad to hear that, Susan! 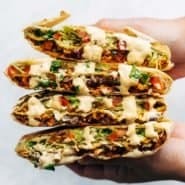 I tried this today and it is DELICIOUS and SOOOO filling. This was my first time using the Instant Pot and it is stupid easy (as in I’m challenged in the kitchen and I could operate it with no problem). I could not get the De Lallo products so I had to sub but tried to get as close to as possible. I also did shaved brussel sprouts in place of the cabbage because in addition to being a stupid cooker, I’m a lazy cooker and didn’t want to be bothered chopping the cabbage and my grocery store had a package of fresh, shaved brussel sprouts. As someone else mentioned, mine came out more stewy than soupy. I’m not sure why but I don’t mind. I like the thicker feeling. It makes me feel like I’m eating something more substantial. I will definitely be making this one again. My only question is on the beans. I drained and rinsed mine out of habit (I had that viscous fluid they’re canned in) but maybe you’re supposed to dump it in, canned juice and all? It would have added a little more liquid maybe. And there’s always the option to add water to make it soupier but I didn’t want to dull the flavors. I am loving this instant pot series Lindsay! So much fun! AND it’s totally getting me in the mood for soup season! I’ve been working on IP recipes for a while but I never though to add grains and just let them cook on warm mode, GENIUS! Also I live in AZ where it’s been 120 all month the cool weather happy dance is definitely happening now! I liked this, but it ended up a little too thick and not as tomato-y as I would have liked. I think next time, I’ll do four or five cups of broth instead of water, and add a tablespoon or two of tomato paste. You think you could use Farro in place of the Bulgur…that’s what I have. We’re trying this with farro tonight as well! I made this last night, and my little family LOVED it! My son said, “I don’t like celery or cabbage but I love this soup!” It was great with crusty bread. The only thing I changed was upping the spices a little and adding a good squeeze of lemon at the end to brighten it up a bit. What a fantastic recipe that will definitely be a part of our regular rotation this fall and winter. Thank you! So glad to hear that, Erica! Loved this recipe so much! Definitely will be making again soon. I subbed barley for the bulgur, finagled with the cooking time and it was perfect. Served along with some crusty bread. YUM. We made this last night and subbed out with farro… it was amazing! This will be on the regular rotation for sure! Great to hear, thanks for posting. I love the idea of skipping the pasta, but my son has Celiac. What about subbing buckwheat for the bulgur? I haven’t used buckwheat before and I’m wondering if this would work. Thanks! I think it could work, but I’d maybe cook it before adding it in since it will take longer to soften. How are you so good at this?! Every single recipe I’ve made from your blog has been amazing, and now I have yet another one to add to my repeat roster. 🙂 I made one batch (now kicking myself for not making 2+) and left out the grains. Froze individual portion sizes (pointless, because I’m going to end up eating it all within a week, it’s THAT good). When I reheat it, I add a cup of whatever “ready to heat” grain blend I have on hand. Winner-winner-so-much-better-than-chicken-dinner. Excited to cook this one up again, especially once the cold Wisconsin winters hit! Thank you!! Thank you for all these instant pot recipes!! I finally dusted off mine and put it to use for this recipe. It was pretty easy to make. It didn’t taste very minestrone-y to me, but that might’ve been the pesto/marinara I used and that the fact that I threw in the bulgur right at the beginning and it sorta disappeared! So try not to do that! I saw this comment a couple of other places, but didn’t see an answer. At the end of step 2, do you turn the IP onto rice setting/soup setting? Or do you just let it sit? Hi Caitie! You just let it sit on the “keep warm” setting. There’s enough heat built up that it’s able to cook the bulgur. I liked it. I think it has too many beans and too much cabbage. That is an easy fix though! Very simple and easy. Veg prep is the longest task so doing it the night before is ideal. I have finally decided to take the instant pot plunge. I have been browsing through to see which one Lindsay used and I can’t find the post. Can you please share? Thanks so much. Looks Yummy! Gonna make it this weekend. Love the bowl in the picture! Do you mind telling me where u got it? Made this using my homemade basil pesto, red pepper flakes for a little kick and added sliced baby bella mushrooms. Bellisimo! It is thick enough in my opinion that not adding pasta or grains isn’t a deal breaker. Love the addition of smoked paprika! Thank you for sharing! This recipe is so delicious! I’m making it again for a new Mom this afternoon. I used pearled barley instead of bulgur and I threw it in at the beginning, so it cooked. It came out great! This will be a regular in the fall/winter recipe rotation. Oh, also I used Trader Joe’s tomato basil sauce, since I already had a jar and it was really delicious. This was a really delicious soup. I was skeptical because when I made soup the slow cooking of the veggies in the fat brings out the flavor. However, I wanted to try this to use up some veggies and it turned out great! I always use fire roasted organic canned tomatoes to add the flavor that is missing when you cool soups quickly. I used the “10 Minute Farro” from Trader Joes in this because they didn’t have bulgur and it was perfect! 10 minutes on the “keep warm” setting after I released pressure was all it needed. I also cooked the soup for less than 30 minutes since it takes so long for the pot to heat up and pressurize, I only cooked it for about 15 minutes on low pressure and that was enough. So yummy! Just made this, it’s delicious! I wasn’t sure about the bulghur at first, but it’s perfect. Thanks! Yumm!! I am all for easy throw it in and put your feet up! But just sayin, if you turn instant pot on sauté and throw some olive oil in there you can sautee your onions while you chop your carrots and celery, throw them in while you chop your cabbage… no more time but increases the flavor!! Would love to make this recipe in my instant pot! Unfortunately I only have the 3 quart version, do you think this is possible if I halved the recipe? Hi! I’m new to the whole IP thing, so I’m not sure if you put a manual setting of 20 minutes on for the bulgur part or you just keep it on warm. Anybody know? Love the flavors and all the veggies. Adding to cold weather comfort food meals list. Thanks!